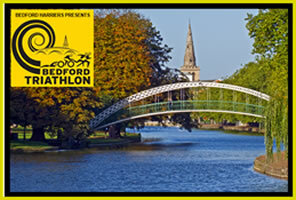 Located in Bedford with the backdrop of the magnificent Embankment, its river and the well-known Suspension and Butterfly Bridges has the potential to rival any other triathlon event both locally and nationally. Bedford Harriers reputation in offering high quality and friendly races is now being extended to offer a Triathlon. Our intention is to bring a high-quality event back to the heart of Bedford to introduce the local community to triathlon and to enable the Club to inspire and encourage more to participate in sport. The race will be suitable for both Elite and experienced athletes, but also those new to the sport that want to experience their first open water triathlon in a beautiful location.